Are you worried that water will damage your new floors? Discover beautiful waterproof flooring in Colorado Springs, CO. Absolute Flooring America brings the beauty of hardwood, carpet, and vinyl into any room, including bathrooms and kitchens. If your room is prone to spills or moisture, consider waterproof vinyl flooring or carpet. Using advanced manufacturing techniques, these products are designed for active living and moisture-prone environments. You want an attractive floor, but you also need it to resist water. We carry and install waterproof luxury vinyl flooring that is ideal for kitchens, bathrooms, basements, cafeterias, mudrooms, and any other room that gets wet. In addition, you don’t need to settle for a dull-looking floor. Our products come in many styles and colors. In fact, they are fabricated to look like wood flooring, ceramic, and natural stone. These floors are both stylish and appealing. Why spend money on floors that don’t last? These products are manufactured using materials that hold up even in the wettest environments. Visit our store for assistance if you need waterproof flooring that is durable and appealing. One of our friendly and experienced associates can help you choose a product that suits your needs. Why Choose Waterproof Vinyl Flooring? 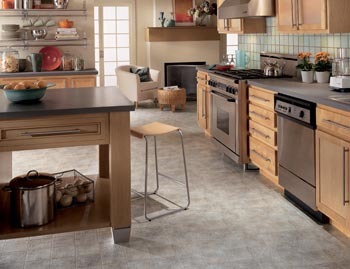 Add unique ambiance to your kitchen or bathroom with waterproof vinyl flooring. Some owners really enjoy the value-added appearance of hardwood or natural stone. However, they cannot place them in water-prone areas. Even though natural stone is not susceptible to water damage, it can be hard underfoot. For a softer, beautiful, and durable choice, consider waterproof vinyl flooring. Because these products have waterproof cores, they will not degrade, rot, or expand. They also prevent in liquid from seeping onto the subfloor. In addition, they are easy to maintain. Simply sweep and mop your new floor whenever it is dirty. They also hold up well under heavy foot traffic and are perfect for busy households. Some of the brands of water proof vinyl and carpet flooring we carry include Tigressa and Downs. Protect your carpet from spills, pet accidents, and moisture by letting us install waterproof carpet. Not only are these carpets stain resistant, they do not suffer from water damage. In fact, they also prevent water from penetrating the floor beneath. Instead of worry about your carpet, why not let your carpet ease your concerns. Our state-of-the-art carpets offer a level of protection that ordinary carpets cannot. There’s only so much stain guard can do to protect your rugs and carpets. For bigger spills and persistent moisture, you need a dependable solution. How about carpet that will not stain? That means no worries for you. Simply wipe up the spills, and be done with it. It’s that easy. For larger spills, soak up the liquid with a towel or use a shop vac. But don’t worry. The liquid will not reach the subfloor. So you won’t have to be concerned about damage or mold. Contact us for more information about our waterproof flooring options and our 12-18 month financing program. We proudly serve Colorado Springs, Monument, Black Forest, Manitou Springs, Colorado, and surrounding areas.